If you think weekends are dead quiet in Perth, then take a visit to one of our many dim sum places in Northbridge. Overseas visitors have commented that our dim sum in Perth is pretty good compared to other countries, so I think our dim sum is on par with the best. I had arranged to meet my friend at the Welcome Inn at 12pm. When I got there, it was already packed full, and I had to take a ticket to secure the next available table. I had to wait around 15 minutes to be seated at a table. A lot of these dim sum place open early, and if you don't like to queue up, I suggest you go at around 11am to avoid the hassle. 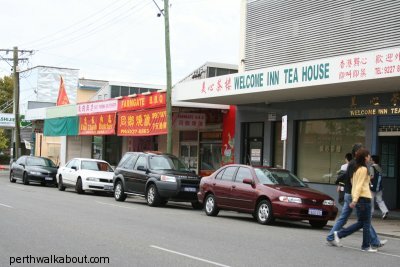 The Welcome Inn is a popular place for dim sum. It used to be located further down William St closer towards the Brisbane end. Since relocating up William St to a newer building quite a few years ago, the restaurant has been doing a roaring trade. The restaurant was at full capacity and I noticed that there was a constant turnover of tables as groups of people left and other groups entered. There is a hustle and bustle that goes with dim sum places as waitresses navigate the food trolleys between the closely spaced tables, and tables are prepared for new customers. Upon being seated, I ordered some Chinese tea. The Chinese tea is great for quenching the thirst, as you work your way through the various dim sum dishes. My friend and I enjoyed ordering the dishes as waitresses came by with the trolleys. If a particular item is not on the trolley, you can order an item from the kitchen. The service is efficient. It has to be in order for a dim sum place to thrive! There was the usual repertoire of fried and steamed items, and desserts on offer. We ordered some ha kao (prawn dumplings), ha cheong (prawn rice flour rolls), chicken feet, fried squid and beef brisket. A serve of chilli in oil is essential to go with the steamed items. My friend introduced me to the beef brisket. I don't usually eat much beef brisket, but I have to say the beef brisket was exceptionally tender and cooked in a tasty sauce. The steamed dishes are my favourite as they are healthier than the fried dishes. We also ordered some egg custard tarts for dessert to be consumed later. I enjoyed the time catching up with my friend over dim sum. Time flew by quickly and the waitress signalled for us to pay our bill as the restaurant was getting ready to close at 3pm. Our bill came up to $23 for the two of us. Dim sum usually ranges from $10-$16 per head depending on how much you eat. Till the next dim sum!